In my mind, every holiday is basically about food on some level. The Fourth of July conjures memories of grilled burgers and hot dogs, buttery corn on the cob, potato salad, and juicy watermelon slices, all served on flimsy, flowery paper plates. I love summer food — messy, informal, and delicious — and that’s one reason I love the Fourth of July. 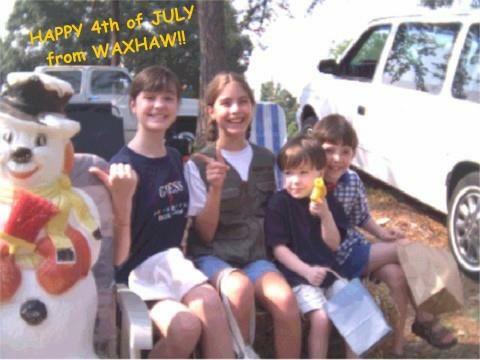 Growing up, my family didn’t go all out with fireworks (which was maybe for the best because it sure cuts down on the potential for injuries) but we did attend the Fourth of July Parade in the nearest town almost every year. It was everything you could want from a small-town Southern parade: homemade floats and vintage cars, boy scouts and baton twirlers, unintentionally scary clowns and Shriners in their mini cars. We would camp out on the side of the road with picnic food and lawn chairs and spend the entire morning eating, chatting, and watching the parade. Inevitably, someone on one of the floats had a super soaker and aimed it at the crowd, and as kids we pined for splash of cold water in the sweltering heat, even if the cooling effect quickly faded and left us sticker and sweatier than before. My mom — who has always loved things that are kitschy and quirky — found a plastic snowman at a church rummage sale before the parade one year. She bought it on the spot and proudly set it up in one of our chairs for everyone to see. For the rest of the day, she joked about celebrating Christmas in July and said that we should make our own float next year with Santa on it. I was 11 that summer, just on the cusp on adolescence, and while I was homeschooled and a late bloomer, that doesn’t mean I wasn’t already developing a keen sense of embarrassment when it came to my parents. Mild mortification was my primary emotion over the plastic snowman. Still, I obligingly posed for a picture with it and now it brings back fond memories. While burgers and corn on the cob are very important, one dish that will always make me think of summer is pie — peach pie, to be exact. In my teens I decided that I would perfect the art of making pie crust from scratch. I baked pies all summer long (my family was delighted), and I think it’s the ideal all-American dessert for your Fourth of July party. Pie crust is a little tricky, but it’s worth it. And once you get the hang of it, it’s really quite simple. The recipe below is from my copy of the Joy of Cooking, but Deb Perelman over at Smitten Kitchen also has a great all-butter pie crust recipe and some excellent advice. Mix the flour, sugar, and salt in a large bowl. Add in the chunks of cold butter and shortening and use a pastry blender (it’s well worth the investment, trust me) to cut the butter/shortening mix into the flour until it has a pebbly consistency. If there are some slightly larger bits of butter, don’t worry, that makes a flaky crust! Then add the ice water a little bit at a time and blend until the the dough just barely sticks together. Cut the dough in half, wrap each disk in plastic wrap, and chill it in the fridge for at least 30 minutes. Don’t skip this step — if the butter in your dough gets warm it’s impossible to roll out and you won’t get those nice flaky layers in the finished crust. Preheat the oven to 400 degrees. Mix all the filling ingredients in a bowl and let stand for a few minutes. Roll out your bottom crust and lightly press it into a 9 inch pie pan (I find it helpful to gently fold the dough in half, lift it into the pan, and then unfold it). Trim off the excess crust, but be sure to leave at least an inch hanging over so you can crimp the top and bottom together. Pour the peach filling into the pan and then roll out the second crust and place it over the top. Crimp the edges and remember to cut four vents in the top crust. If you like, brush the top with a little milk and sprinkle on some extra sugar. I almost always forget this step, but my pies turn out just fine without it. Bake the pie at 400 degrees for 20-30 minutes, until the crust is set and beginning to brown. Reduce the oven temperature to 350 and bake for another 30-35 minutes until the filling is bubbling over and the crust is a deep golden brown. You can place a cookie sheet under the pie to protect your oven from the bubbling fruit juices and if the crust gets too brown before the filling is done, just cover it with some tin foil to prevent further browning. After it’s done baking, let the pie cool before you slice into it, otherwise it will still be very runny. Don’t get upset if your pie isn’t picture perfect. I like my pies to be homely and rustic, personally. And once you serve it up with a scoop of vanilla ice cream, it will be gone before you can blink. I decided to share some of my favorite recipes because, especially in the aftermath of the move and adjusting to life in a new city, cooking my favorite foods gives me a sense of continuity. When my life is in transition, I feel most grounded when I’m in the kitchen. Chopping and mincing, seasoning and sauteing, kneading and baking — when I enter the kitchen, my whole world shrinks. I stop worrying about whatever freelance assignments I’m juggling, or whether my latest job interview went well or not. Instead, I savor the flavors, the colors, the textures, the aromas in front of me. I’ve cooked and baked my way through many a rough transition. I baked my emotions during my hormonal teenage years in my family’s narrow galley kitchen. I happily dropped the meal plan and cooked for myself senior year of college in my bland on-campus apartment kitchen. I staved off post-graduation anxiety during the first summer after college by experimenting with uncommon farmers’ market produce in the teeny tiny kitchen of the sublet I rented with the man who would become my husband. 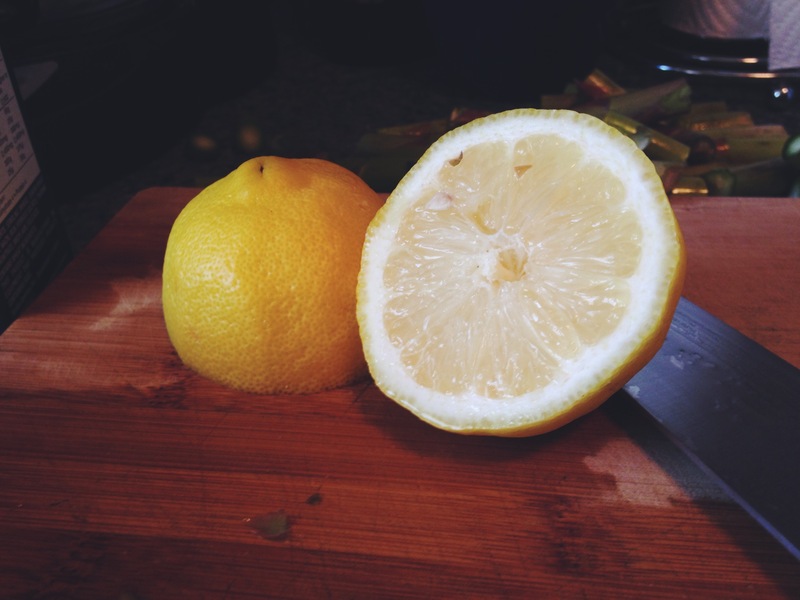 My husband and I made meals together often in the much larger kitchen of our next apartment, the one with the sloping ceilings and old fashioned red linoleum countertops, while we navigated jobs, grad school, and the stress of wedding planning. Now, I’ve squeezed myself and my growing collection of kitchen gear and cookbooks into our current, rather small kitchen and I’m still doing what I love best: cooking (and eating, of course). Quick disclaimer: I’m not going to share anything fancy or unusual here. These are simple, get-dinner-on-the-table recipes and sometimes the measurements are just a rough guide because I don’t measure things very often, I just eyeball them. I adore asparagus and my husband loves pasta, so when my aunt introduced me to this easy pasta recipe a few years ago, it quickly became one of our favorites. We’ve been eating it a lot lately, because nothing beats fresh asparagus. I highly recommend picking some up at the farmers’ market instead of the grocery store if possible. This is also good with whole wheat pasta if you’re feeling healthy. Bring a large pot of salted water to boil and add the pasta. When the pasta is almost done, but not quite, add the cut up asparagus to the pot and bring it back to a boil. 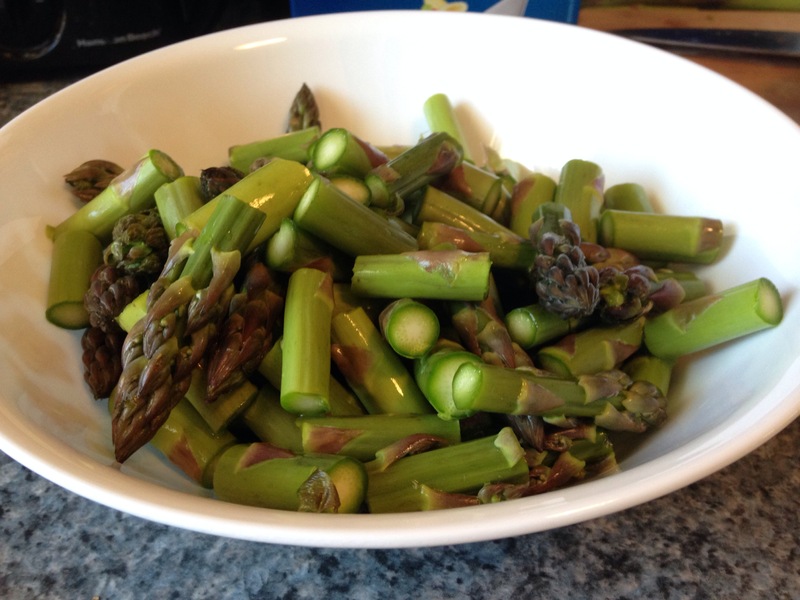 Cook the pasta and asparagus for 2-3 minutes (I like the asparagus to stay slightly crisp and crunchy) and then drain the contents of the pot and run cold water over everything to cool it down. 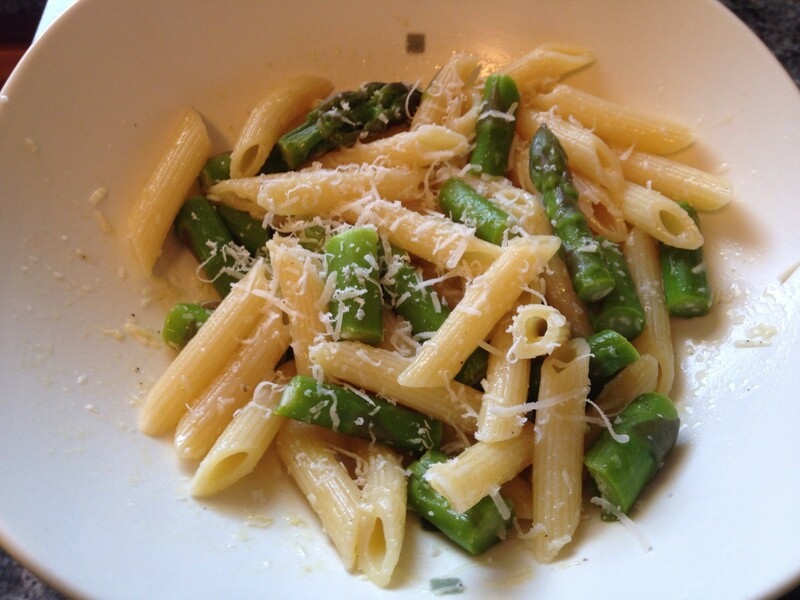 Return the pasta and asparagus to the pot and toss with the lemon dressing. Dish it up, sprinkle on some more cheese if you like, and enjoy. Time for life updates, y’all. I’ve been trying to write this blog post for weeks and I get overwhelmed every time, but in the interest of defeating writer’s block, I’m just going to start with the facts. 1. In mid-April, I moved to Columbus, Ohio. I quit my job, packed up all my stuff, said goodbye to friends and family, and left. The Buckeye State (and my new home). Click for source. So, those are the new facts of my life. It looks plain on paper — people move for jobs all the time. In fact, we’re actually very lucky that my husband landed this job just a few months after graduation. It felt right and so we made the leap. It was a big leap, though. I walked away from a promotion at a job that, for the most part, I enjoyed. I gave up my breadwinner status along with my steady income. I left some of my best friends. I left my church. I can’t drive down and see my parents on a random weekend anymore. Almost everything was stripped away — my job, my community, even the familiar dynamic of my marriage. And here I am, trying to pick up the pieces. During the move, some people questioned my decision, and I was one of them. Was I nuts to move to an unknown city with uncertain employment prospects? Maybe. But the people I love and trust the most said, “You don’t have to know what happens next, you just have to think ‘if the status quo is good, then what would be great? '” And so I packed up my life, guided by a deeper conviction that this move will open up new opportunities not just for my husband, but for me as well. Of course, now that I’m here, I feel sad and homesick a lot. Columbus is thrillingly new and intimidatingly unfamiliar. I want to artificially speed up the time it takes to learn a place, to find the best neighborhood dive bar, the best felafel wrap, and the best cup of coffee. I want to know how the streets intersect, and what’s happening on the weekend, and where I belong. But I have no regrets, so let’s talk about the good stuff. First, this painful process has jarred me out of autopilot. I’m forced to stop and consider things like, “Where is my career going and where do I want it to go?” My husband remains one of my number one cheerleaders and sources of support — things are different, but I feel happiest when we’re just hanging out cooking dinner together like we’ve always done. And my parents might be far away, but I’m reconnecting with extended family members. (Did I mention that I was born in Ohio? Yeah, the irony of this isn’t lost on me either.) And I get to wear yoga pants pretty much all day, every day. The novelty might wear off on that last one. We’ll see. Earlier this month I flew to California to see an old friend in San Diego. We took a few days and drove out to Joshua Tree. Conclusion? The desert is my new spiritual home. It was magical and alien and inspiring all at the same time. I want a vacation home there so I can spend all my winters in the high desert. In the meantime, these pictures will have to do.